Finding a job and maintaining an employment or work career is not an easy dream to fulfill by anyone especially if a company that is looking for employees have high standards for the sake of their business. And in order for these companies to meet their needs and ensure that their expectations for the entire year will be met as well, they make employment application forms to be handed to anyone who plans to be an employee. What Is an Employment Application Form? 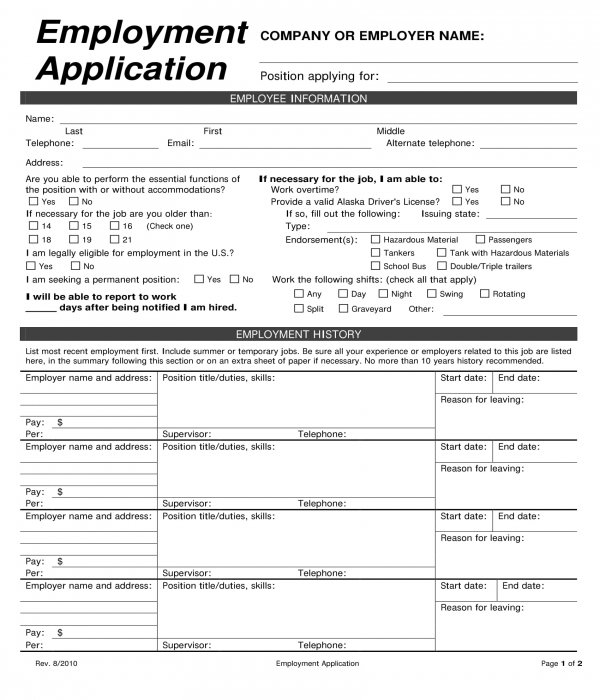 An employment application form is a document that the human resource and recruitment personnel of a company will create for their job applicants. The objective of this type of document is to collect necessary information of the applicant for the benefit of the company and the employer who will be conducting the selection and hiring procedure. 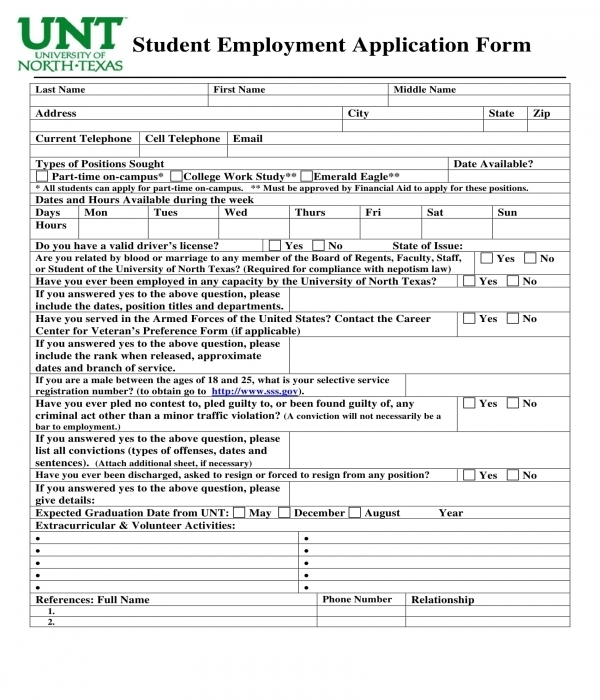 Compared to a resume form which is often handed by applicants along with a resume cover letter, an employment application form is standardized based on the company’s needs and not on what the applicant can or could not provide as a piece of information relative to his intent in being part of the company. 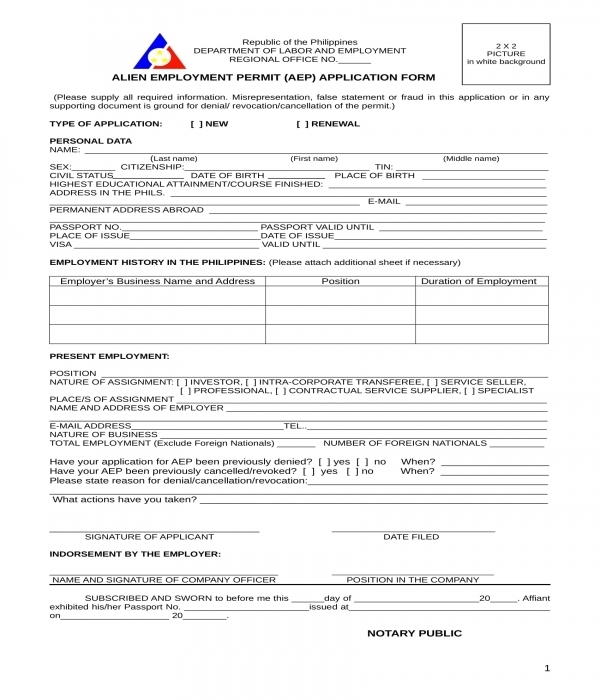 There is also another type of employment application form, however it is not intended to be used by companies during their application and hiring phases, rather it is a required document to be filled out for employment application purposes such as for the intents of a foreign national to work in a foreign state, or for the intent of an individual to hire people for his own company wherein he must acquire a type of employment permit before proceeding to the hiring process. 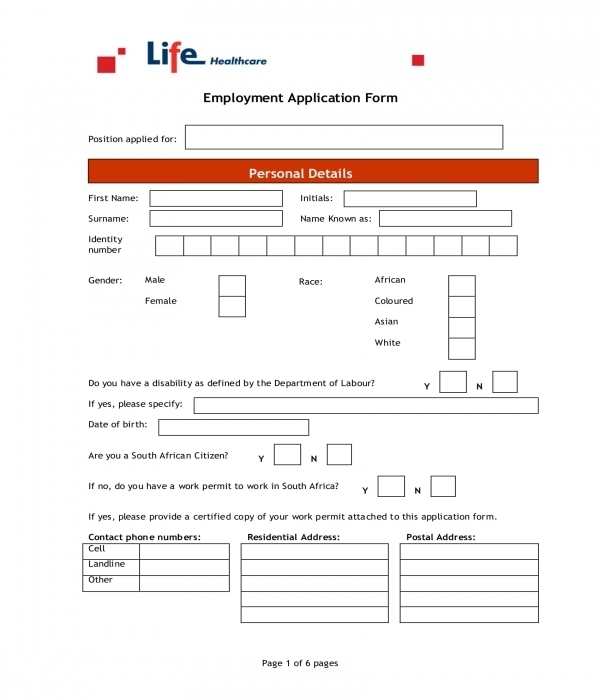 Why Do Companies Use Employment Application Forms? For consistency. Resume forms and even bio-data forms can have varying types of information which are disclosed by applicants. Most of the disclosed pieces of information in these documents are aimed to please employers rather than provide honest details and be transparent about the applicant’s skills, histories, and what he can give to the company. This is why companies use employment application forms to ensure that only the important details of each applicant, regardless of their background or where they came from, will be provided and be stated in the form. It helps in easing up the selection process by being able to compare one applicant’s capabilities and achievements to the other since the forms will have the same layout or arrangement. To document the acknowledgment of the applicant in supplying facts and true data to the employer. At the bottom of an employment application form, there is a section intended for an applicant or employment acknowledgment statement. This is an essential section to be filled out and be signed by the applicant. The focus of this statement is to document the approval of the applicant to the needs of the company to use his information for hiring and employment purposes, as well as indicate that he had disclosed only factual and updated information to the application form. This holds the applicant accountable to the data that he is stating in the application and liable for any penalties or disqualifications if it is proven that he wronged the company or the employer. Serves as a supporting document for the company. Aside from the hiring and selection phase of the company, an employment application form which was filled out by an applicant can be an instrument that the company can use even after the applicant is hired. With the form, the company can fill out their employee database and other systems which will require the information of the newly hired employee. Alien Employment Permit Application Form – There are countries who will only permit a foreign national to be employed in their land if he had acquired the approval of the country’s labor organization or department. This approval is in the form of a work permit certification. Foreign nationals or foreigners who plan to be employed and stayed employed in a foreign land will have to complete and file an alien employment permit application form first along with the required documents that he must submit to prove his identity and his capability in his preferred employment needs. In an alien employment permit application form, the user or the foreign national will have to stick his image at the top-right portion of the form, specifically an identification picture. Then, he should indicate the type of application that he is aiming, whether it be a new application or a renewal of the former application that he had made which met its expiration date. Following the application indication of the foreign national are four sections. The first section is for his personal information where he must disclose his name, gender, citizenship, civil status, birth information, address details, as well as his passport number and validity, and his visa expiration date if the country that he is currently residing in requires visa from foreigners for them to enter the premises of the country. The second section is for the employment history of the foreigner in the country that he is recently residing in, while the third section will collect the details of his current employment. The last section of the form is composed of two areas wherein the first one is for the endorsement of an employer or anyone who is willing to hire the foreigner, and the second one is for the notarization and signature of a notary public. 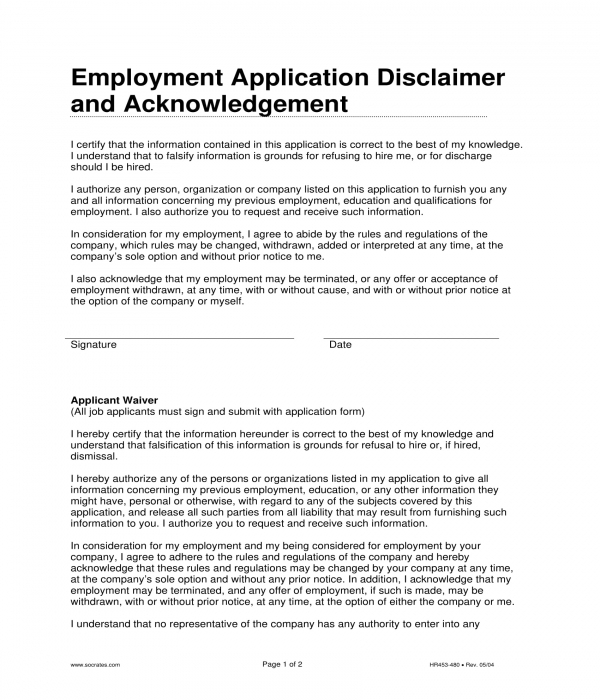 Employment Application Disclaimer and Acknowledgement Form – This is a type of document which should be enclosed and submitted with the completed employment application form of an applicant. An employment application disclaimer and acknowledgment form will have two sections which are composed of statements. The first section centers on certifying that the applicant has provided the information in the application form based on his knowledge as well as the approval of the applicant to authorize the company to use his information. In addition, it will also state an acknowledgment which focuses on the agreement of the applicant regarding employment termination possibilities for his position in the company depending on what the company and the management prefer even before the date of his intended employment period. The second area or statements in the form centers on details about the company’s applicant waiver. This portion of the form is essential for indicating the applicant’s approval and understanding in waiving his rights to sue or to hold any member of the company liable for any issue or penalties in relation to the usage of his information which had been disclosed by him in the employment application form. Moreover, both sections in the form must be signed by the applicant along with the date of when he was able to affix his signature of the form, and the name of the company representative, as well as his signature, who received and processed the applicant’s application. 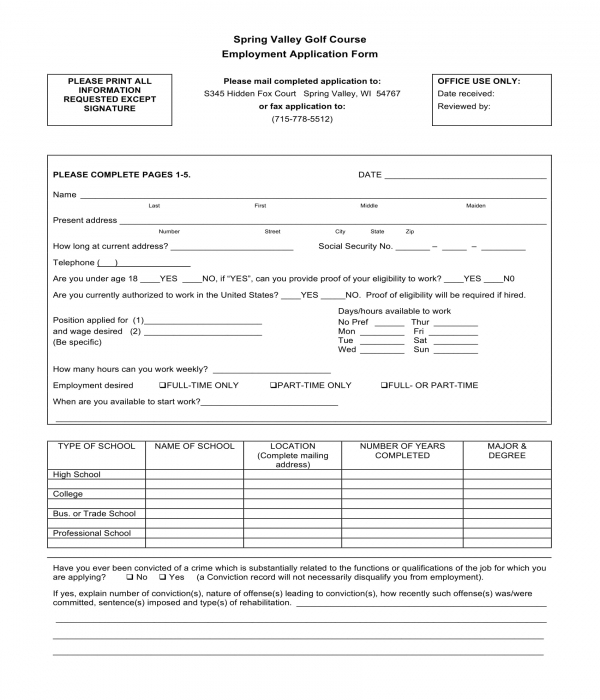 Student Employment Application Form – This type of employment application form is to be used by student job applicants only such as interns and trainees of business companies. The first portion of the form is the student information section. Then, sections for the student’s work experiences, organizational involvements during the previous semesters or years as he studied, and the reasons why he left the jobs and organizations that he disclosed in the form. And just like any other employment application, the last portion of the form is where the student must affix his signature to certify the facts and truths of his statements and data in the form. There are companies who prefer to hire for vacancy positions internally which means that the search for the new employee for that position will be conducted only within the company. On the other hand, the most common hiring preference is through external hiring wherein applicants from outside the company are encouraged to get involved and have a chance to be an employee of the form. And if a company offers these two on separate occasions, they must also create two documents: one for an internal employment application, and another for an external employment application. With this, the company, especially the assigned hiring personnel or employer, will be able to distinguish which among the applications came from their already hired employees and which are from the outside applicants.